The poet Tennyson and the artists of the Pre-Raphaelite brotherhood in the 19th century were depending heavily on Malory (see the menu on the left under Legends) for their Arthurian inspiration. The death of Arthur and his passing to Avalon, the flawless grail-knight Galahad, mysterious ladies and the attainment of the Holy Grail were amongst the favourite subjects of the Pre-Raphaelites. (See: La Mort D'Arthur, Archer (1860); The last sleep of Arthur in Avalon, Burne-Jones (1881-91); The Attainment of the Holy Grail, Burne Jones, Stanmore Hall tapestry executed by William Morris & Co. 1898-9; Galahad, Watts (1860); "I am half sick of shadows" said the lady of Shalott, Waterhouse (1860); Sanc Grael, Rossetti (1864). Tennyson idealised king Arthur as the perfect king and husband and put Guinevere on trial for her fling with Lancelot. 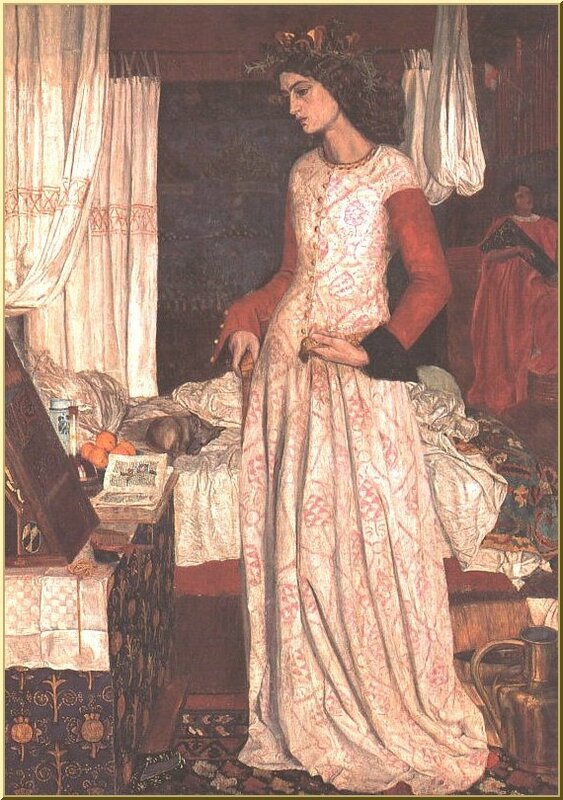 Where Tennyson judged with reason on Arthur's side, the Pre-Raphaelites on the other hand seemed to admire Guinevere for her enigmatic qualities. One of the moving spirits behind the brotherhood, William Morris, wrote a poem The Defence of Guenevere and painted her as the typical Pre-Raphaelite woman: sensual beauties with long, dark, waving hair and melancholy eyes. The model for this Guinevere was his wife Jane Morris. Juicy detail is that William had to endure his wife's adultery with his friend and Pre-Raphaelite brother, the painter and poet Dante Gabriel Rossetti, for years to come. An Arthurian love triangle in real life. In 1862 William Morris got the commission for the stained glass windows for Harden Grange. He choose to depict the Tristan story (based on Malory), but with the emphasis on the love story rather than Tristans many achievements as a knight. In this case the sympathy goes entirely to the lovers Tristan and Isolde. The deceived husband, king Mark, is the bad guy. William asked several Pre-Raphaelite brothers to design the panels, amongst them Date Gabriel Rossetti. (Images of the Tristan stained glass windows). The influence of 19th century Pre-Raphaelite art on popular movies was not that big until two decades ago. Hollywood adventure movies, especially in the first half of this century, were mostly inspired by late 19th century pulp narratives and simplified adaptations of the historical novels of Sir Walter Scott and his successors. The rise of Fantasy as a filmgenre in the late seventies and eighties brought the need for coherent secondary worlds, and that is exactly how the Pre-Raphaelites depicted the Middle Ages, as an idealised romantic time, a coherent world of fantasy. It is hard for me to say how far this influence goes in general, but the Pre-Raphaelite connection is certainly visible in John Boorman's Excalibur (1981). And the ideal Pre-Raphaelite woman seems to have a lot of features in common with the standard type of medieval queens, princesses and maidens in popular films. Whether it is Guinevere Excalibur, Lady Marian in Robin Hood (Reynolds, 1991), Linet in Sword of the Valiant (Weeks, 1982) or Guinevere in First Knight (Zucker, 1995) they all look like Jane Morris: sensual, enigmatic, long dark hair and melancholy eyes.